Getting ready for the Sept. 14th grand opening, Chris Holmsen, a vendor with Marzetti, stocks salad dressing on the shelves at the ShopRite on Black Rock Turnpike in Fairfield, Conn. on Friday Sept. 9, 2011. For the last month, employees at the new ShopRite supermarket at 1975 Black Rock Turnpike have been in training, getting ready for the store's long-anticipated opening. "We're excited to be here," said Rocky Cingari, a member of the family that owns and operates the ShopRite Grade A Market that opened Wednesday, as well as nine others in southwestern Connecticut. Even more excited might be Fairfield residents living in neighborhoods along Black Rock Turnpike and points north. A Shaw's supermarket that previously occupied the site closed in April 2010, leaving those neighborhoods without a major food outlet. 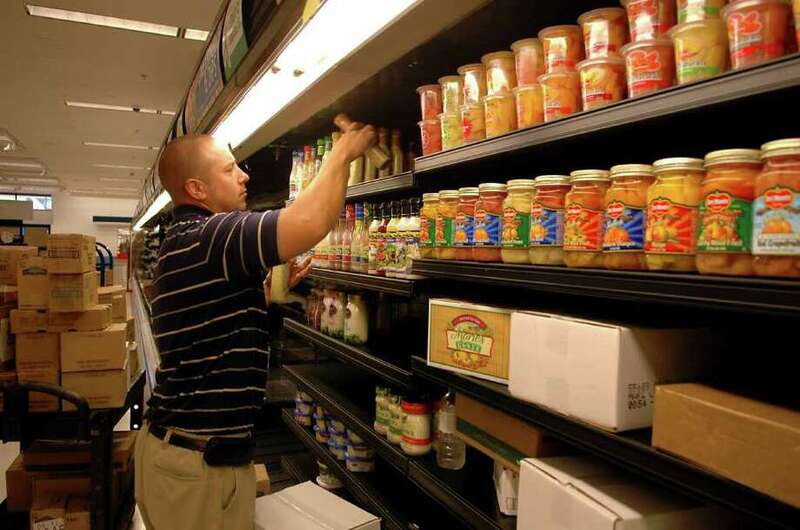 On Monday, employees were still busy stocking shelves. "We've got a very intensive group of people in here to stock the shelves," Cingari said. The work to get the physical building ready was also demanding, he said. "It took an intensive amount of work because we wanted to bring the store up to our standards -- the Cingari family standards and ShopRite's. It took an enormous amount of work, but we're very pleased to be coming into Fairfield," he said. The store renovations include energy-saving lighting and a storewide energy-reduction plan. Inside, shoppers will find an array of groceries and fresh produce, a made-to-order sushi bar and a registered dietician available for customer consultation as a free service. Cingari said the store will also offer a carry-out service for shoppers on request at no charge. The new market employs 182 people, full- and part-time. "Our goal is to get the customer out as fast as possible," Cingari said. "We have an impeccably clean and well-lit store." A proposal to the Town Plan and Zoning Commission to "shave" off a corner of the shopping center complex that houses the supermarket to allow delivery trucks to circle around the building was scheduled for Aug. 9, but postponed at the applicant's request. A new date has not been set. Currently, after making a delivery to the rear of the store, trucks must back up to leave, which neighboring businesses have complained poses a safety threat. The Cingari family has been in the supermarket business since 1943, and today their ShopRite Grade A Markets are in Fairfield and New Haven counties. "Our family-owned ShopRites have long-served the people of Connecticut, delivering the value, variety and excellent service that our customers need and have come to expect from the Grade A ShopRite name," Sam Cingari, vice president of Grade A Markets, said in statement. The ShopRite Grade A Market in Fairfield will be open seven days a week from 7 a.m. until 11 p.m. Telephone: 203-615-0140.